This is one of seven volumes that represent the art some of the performing virtuoso-playing composers of the Romantic tradition. The notes tell us that each volume attempts stylistically to integrate composers who belonged to the same milieu and enjoyed professional relationships with each other. Moscheles' Concerto, Op. 58 is said to be one of his finest works, showing the classical influences of Beethoven, Schubert and Chopin. From the opening of the Allegro moderato one can be forgiven for thinking you are listening to an orchestral score composed by Mendelssohn. However the piano lines have more of a Saint-Saëns ring about them. Bold statements punctuate gently-flowing passages with lightweight orchestral involvement. The Adagio contains recitative-like figures with background tremolos that eventually lead into an Allegro agitato. This movement skips along with a bright theme that is extemporised and builds to a suitable coda and rousing close. Hiller's compositions are largely forgotten now but in his day his works reached the concert hall. His piano impromptu Zur Gitarre was played by Clara Schumann. His Concerto, Op. 69 contains some lovely melodies and has for too long been neglected, a point the CD notes confirm. Hiller premiered the work as soloist in Amsterdam (1856). It was performed in the presence of royalty nine years later, so we must assume that the work enjoyed a certain degree of popularity. This was one of the first piano concertos to utilise the key of F-sharp Minor and is full of ideas also original for the time. A Moderato movement opens the piece with an energetic main theme (without introduction) and use of alternating octaves - a device copied by d'Albert 28 years later. The emotional Andante espressivo is filled with ravishingly romantic melodies. It has a feeling of Liszt about it. A purposeful Allegro con fuoco closes the concerto. Henry Litolff was taken as a pupil for the composer Moscheles. The older man declared Litolff so good that a public performance was arranged which he gave at the age of fourteen. Later as a proficient pianist, Litolff undertook concert tours on the continent and wrote his Concerto Sinfonique about 1846. Berlioz monitored his progress and referred to Litolff "as one of our best composers", praising his knowledge, inspiration, mobility of melodic style, and excellence of orchestration. At 39 minutes it is a long concerto and with a four movement structure broke new ground. There is freshness to this composition that gives me the impression of sprightly youthful eagerness. Why this amazing work is not better known I can't guess, but it would be ideal for part of a Proms programme. An Allegro provides a majestic opening, with accelerating energy and an introduction of two principal ideas. In the Scherzo a Beethovenian hunting scene comes to mind, with echoes of the Ninth. The piano part complements the orchestra-dominated main theme. A peaceful Andante conveys a lyrical mood of relaxing charm, the piano syncopating a flowing horn melody. A bold Furioso moves with urgency before it breaks into a trumpet-led rendering of the Dutch National song "Wein Neerlands". The song weaves in and out of the movement before virtuosity brings the piece to an energetic close. Carl Reinecke is usually remembered for the cadenzas he wrote to other composers' classic concertos rather than for his own compositions. This is despite the fact that he was a prolific writer of around 300 works. His writing is not as demonstrative as the other composers in this set: there is more of a relaxed feel to this concerto. Reinecke made his debut as a violinist at 11 but toured Europe as a pianist, before turning to the education of others. Reinecke settled in Leipzig where he became professor of piano and composition at the Conservatorium. In Reinecke's Concerto the Allegro is a good vehicle for virtuosity, but there is practically no partnership with the orchestra. In the Adagio, sincerity of purpose is given with its meandering theme. A bold statement from the strings opens the Finale Allegro and rippling measures maintain momentum throughout the movement. Mendelssohn's Capriccio brilliant is well known and needs little introduction. Written as a fantasia for piano and orchestra it is constructed on four themes - introductory theme, fortissimo theme, pianissimo theme, and piano theme. It is here played with sensitivity and purpose. Rheinberger is better known for his organ compositions rather than the writing of orchestral works. He studied under Lachner and became an intimate friend of Schubert, yet his music is often linked with Brahms. His Concerto deviates in its opening Moderato from the Beethoven pattern by dispensing with the orchestral exposition and replacing it with a short preludial statement; the piano entering with the main idea and acting as a dominant force. An Adagio follows with lyrical delicacy and appealing musical ideas. The orchestra contributes with important thematic and colouristic contributions throughout. A piano solo opens the Allegro energico with a flourishing statement and running into a fast-flowing theme before returning to the heroic idea of the first movement. This set contains rarely recorded works of the lesser-known composers who provided a valuable contribution to the development of music through the 19th Century. The notes make interesting reading and give useful historical information. Descriptions of the works could have been fuller and more detailed. Michael Ponti plays with considerable dexterity, and handles both powerful and sensitive passages with considerable skill. The orchestras play competently under knowledgeable conductors. The analogue recordings of the '70s are clear without the extraneous noise that can show up in CD transfers of this period. They are pleasantly balanced for concerto recording with the piano placed nicely forward on the sound-stage. In the Reinecke concerto, a slight metallic timbre is noticed with the piano. A slight lack of dynamic range causes some detail of the orchestra to be hidden but this is not an obtrusive problem. There is no obvious mismatching in the acoustics or microphone placements between the different venues (not given). I have a great deal of affection for this VoxBox series and further reviews will follow from John Quinn and Ray Walker. The analogue recordings may sometimes be dimensionally challenged but the missionary zeal of Ponti and others burns no less brightly now than it did back then in the 1960s and 1970s. Ponti, Vox and their second and third league German 'house' orchestras were true pioneers opening up swathes of repertoire. If the orchestras were not top-flight they often played their hearts out for these sessions and a small city orchestra in Germany can be the match for much greater city orchestras outside Germany. It would be wonderful to know more about the adventures of the Vox/Candide team as they trekked across Germany making recording after recording. Perhaps someone from the recording team would be able to write an article for the site. In this focus on Vox it is far too easy to neglect Genesis whose romantic era CDs (all 15 of them) are still available. Of course Hyperion are matchless in this area. Ted Perry's recording quality is modern and the choice of soloists has shown acumen, flare and commitment in a field where the danger of time-serving, note-spinning is always present. 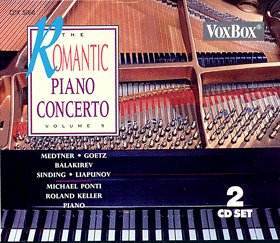 Hyperion's Romantic Piano Concerto series has, over more than thirty volumes (still growing! ), reached far wider and deeper than Genesis or Vox ever did. After all they have done all three Medtners, plus concertos by da Motta and Holbrooke to name only two of the most obscure. The Hyperions are also widely and easily available. The Vox series is by no means entirely a nostalgic journey for misty-eyed old duffers who discovered the repertoire through grainy black vinyl and heavy card boxes. All listeners attuned to the romantic effusion will find great pleasure in these recordings. That edge of discovery, of being a pathfinder, lends sentiment and scintillation to Vox's valuable but extremely inexpensively priced series. Henselt: Concerto in F Minor, Op. 16; Hiller: Konzertstück, Op. 113; Chopin: Allegro de concert in A Major, Op. 46; Kalkbrenner: Concerto No. 1 in D Minor, Op. 61; Hummel: Piano Concerto, Op. 110 "Les Adieux"
Philharmonia Hungarica, Othmar Maga; Orchestra of Radio Luxembourg, Louis de Froment & Pierre Cao; Berlin Symphony, Volker Schmidt-Gertenbach.